The Daring Baker challenge for this month is of course chocolate. I would think that if it hadn't, there would have been a mutiny, it being February, aka the month of looooooove. This recipe is deceptively simple, with only 3 - 3! - ingredients. The few ingredients and short prep and baking time are totally contrary to what you end up with, which is an incredibly fudgey, dense, amazingly chocolaty dessert. I passed on the ice cream, instead serving the cake with raspberries and whipped cream sweetened with homemade vanilla sugar. I baked the cake to the directed internal temperature, but was a little unhappy with how soft the center of the cake was. I found it hard to cut and plate the pieces with the points being so soft. But it was hard to care too much about presentation after the first bite. The best thing about this cake was that it was Scott's birthday cake and he loved it. The second best thing was the refrigerated leftovers were actually even better than the fresh cake. Firmed up by the cold it was almost like a chocolate pate. Chocolate lovers will want to try this recipe for sure. Thanks Dharm and Wendy! Here's my third recipe for the final Weekend Cookbook Challenge - Love. Shake all ingredients well with ice. Strain into a tall or squat 8 oz glass. This is the final Weekend Cookbook Challenge! The theme is Love and the deadline is March 15. Send you posts to me at iliketocook AT shaw DOT ca. The New Spanish Table by Anya von Bremzen. It's a phenomenal book not only for the recipes (everything from tapas to desserts) but also for the writing and the photos. They are few photos of actual dishes from the book, but many ingredient shots and photos of Spain and markets that will make you want to book a flight and get the heck over there. I've had this book for a couple of years and though I've read it cover to cover a few times, this is the first time I've cooked from it. It didn't take much flipping thru it to find the recipe to make, Setas Salteadas Con Jamon Y Allioli, or Sauteed Wild Mushrooms with Ham and Allioli. I was excited to find this recipe because first, who doesn't love ham and mushrooms and garlic on toasted bread, and second because I've never made allioli (that is how the book spells it) before. I started with the allioli. It's a mixture of egg yolk, garlic, lemon juice, olive oil and canola oil. Whiz the yolk and friends in the blender while slowly drizzling in the oils et voila! You have allioli, aka mayonnaise. My first mistake was not using the blender, but instead the mini chopper that fits on the blender base. I started drizzling in the oil and the allioli started spattering out the sides. I had to stop, wipe everything up and transfer the partially blended sauce into the blender, which I should have used in the first place, and continue. My second mistake was blending too long. The sauce went thick, and then back to thin. I gave up, scraped it into a bowl and seasoned it with salt. The mushroom saute went much more smoothly. After sauteing garlic and diced ham in olive oil, the mushrooms are added and cooked until all the liquid has been evaporated. When stirring in the parsley I also added a splash of lemon juice. The mushrooms mixture is spooned over toasted bread and drizzled with the allioli. Doesn't that look heavenly? It was absolutely wonderful. The allioli ended up splitting and was not thick at all, but the flavor was nice and it went very well with the dish. I will be working on my allioli skills so I can make this again. Stir together both oils in a measuring cup with a spout. Place the garlic, egg yolks, and lemon juice in a blender and pulse until a coarse paste forms. With the motor running, add the oil in a slow, thin, steady stream. The mixture will be the consistency of a thick mayonnaise. Scrape the allioli into a bowl and season to taste with salt, and more lemon juice if desired. Let stand for at least one hour before serving, or cover and refrigerate if keeping longer. If the allioli seems too thick, thin it out with a little water before using. Heat the olive oil in a large skillet over medium low heat. Add the garlic and ham and cook, stirring, until the garlic is very fragrant but not browned, about 2 minutes. Increase the heat to medium high, add the mushrooms and cook, stirring, until the mushrooms have released and reabsorbed thier liquid and are lightly browned, 6 to 7 minutes, adding more oil to the pan if it looks dry. Season with salt and pepper to taste, then stir in the parsley (and lemon). Transfer the mushrooms to a serving plate or grilled bread or toast, if desired. Generoulsy drizzle the allioli over them. Serves at once. Serves 2-4 as a meal. I had decided a couple of months ago that it was time to wind down Weekend Cookbook challenge. Last month was actually going to be the last one, but I got sidetracked and distracted and moved it to this month. It has been great fun running WCC for the past 3 years, but the time has come. Originally I was not going to say anything, just write a thank you and goodbye in the round up, but after chatting with a couple of WCC regulars this weekend, they argued I should give some advance warning in case anyone wanted to take part one last time. Because I've already contacted the next 3 people that were slated to host and told them it was all over, and again, because I think it's time to say goodbye, I don't want to do another challange. But what I'm going to do is extend this one. So, join me in saying goodbye to Weekend Cookbook Challenge! Challenge 37 has been extended to March 15. The theme is Love, but we've never really been about rules here. Do what you like! Send your posts to me by March 15 at iliketocook AT shaw DOT ca. I can't believe I'm already on 5! This is going by quickly. Ok, book 5. This one makes my hand hurt. This book was all written out by hand, all 193 pages. This one is a mix of recipes of mine, from cookbooks from the library, and some of my favorite food websites and bloggers. There's also LOTS of healthy recipes - cooking light, canyon ranch, weight watchers. I should really make some of those. Flipping thru, I don't think I've done a lot of cooking out of this one. Other than my own recipes, and some food blogger ones, most of these are untried. Hmmmm, what do you think I should try next - fried goat cheese with honey? zucchini tart? hoisin meatballs? thai chicken wings? pasta e fagioli? If you look at the photo below, you can see a big X and possibly make out the words no good on the previous page. That was a Martha Stewart recipe for black beans that was SO BAD. There are no words. The beans went in the garbage, and we went out for dinner. So I was a little nervous that I chose the Martha recipe on the next page to make for this celebration - Spicy Corn and Peppers. What if it sucked too? Well, fret no more, it didn't! In fact, this recipe rocked. This was such a good dish! Easy to make, and so delicious. It's not really spicy, but you could always jack up the cayenne or add some hot sauce if you wanted to. This is for sure going into regular rotation in our kitchen. Melt butter and add onion, bell pepper, cayenne and 1 tsp salt. Cook 5 minutes until onion is soft. Add corn and tomatos and cook for 10 minutes. Stir in milk, remove from heat and serve. I want to buy some miso paste for cooking and soup. I know nothing about the different kinds and online stuff I've looked at only makes Sara more confused. If anyone out there could email me and let me know your miso preferences, or links that would help me out, it would be much appreciated! Back in June I posted a Wordless recipe for toast with peanut butter and bacon. An anonymous reader left a comment on that post with instructions on how to make peanut butter bacon spread. When Scott read that, there was no stopping him. It was really really good! I was skeptical, but was won over. Salty smokey bacon and creamy peanut butter are a match made in heaven. We saw Jamie Oliver make this relish on his new(ish) show Jamie at Home - Jalapeno Avocado relish. At least, that's what I call ours. His is called something else similar, but the book is alllllll the way in the other room right now. I first served the relish with some chicken breast I'd smoked in an old smoker bag. That bag had to have been 5 years old. About time to use it. The chicken and relish paired well together. The smoked pineapple, not so much. Grilled pineapple rocks. This smoked pineapple just tasted oily and weird. A waste of perfectly good pineapple! This received good but mixed results. I'd had a choice between 3 kielbasa's at the store. I personally don't think I chose the best one. I enjoyed the "soup" part (I didn't cook it as long as the recipe recommends, so it was soupy, which is what I wanted), but wasn't crazy about the sausage. I found it too firm. Scott just loved the whole thing, and ate 2 bowlfuls that night. I divided the leftovers into lunch for Scott for the next day, and the rest for my parents. And mixed reviews from them too - my Dad enjoyed the veggies and soup, my mom thought the sausage was the best part. Back in the summer Scott's sister, brother in law and our nephew came to visit. That kid survived on a diet of ribs, skinny cow fudge pops, peas, and goldfish crackers the whole weekend. (The adults ate pretty much the same thing, with a few cocktails in the evenings.) One day I sat with my nephew as he ate his snack, and he was kind enough to share a couple of his goldfish crackers with me. They were good! A month later on holiday, a bowl of goldfish crackers turned up at the bar we were having a pre-dinner drink at, and when we went home, I added them to my grocery list. The bag sat untouched for a couple of months until I was trying to figure out what to do with some chicken for dinner. Cheddar Chicken Fingers were born. The little crackers were so happy to go swimming in my mortar. Or pestle. A massacre! Avert your eyes! I lightly spread the chicken strips with mustard, and breaded them with the ground up flesh of hundred of small cheesy goldfish. Then they were baked and eaten. The end. This was a Nigella recipe for Risi e Bisi - Rice and Peas. Basically a soupy risotto. It was ok. This month is a very special month in the land of the Babes - our first anniversary! Tanna is our hostess of the month and she has chosen Pane ai Cinque Cereali con Nod (Five~Grain Bread with Walnuts) from The Italian Baker by Carol Field. This is a really interesting bread. Unlike previous breads we've tackled, there's no starter, no wet dough, no 3 day processes. The method is quite simple - mix the dough, 2 rises, bake and devour. What makes this one interesting is the 5 flours and the walnuts. This recipe calls for all purpose flour, whole wheat, rye, oat, and rice flours. I had the first 3 on hand, and ground up some rolled oats in my food processor to make the oat flour. And I bought brown rice flour at the natural food store. I really waffled on the walnuts - I was going to add them, I was going to omit them, on and on. In the end I was going to use them, but ended up having to leave them out as I forgot to buy them. But I must tell you, the bread didn't suffer for the lack of walnuts. It is fab-u-los! First Rise. Place the dough in a lightly oiled bowl, cover with plastic wrap, and let rise until doubled, about 1 hour. Shaping and Second Rise. Turn the dough out onto a lightly floured surface. The dough should be moist, firm, and noticeably elastic, if slightly sticky. Cut the dough in half and shape each half into an oval loaf to fit a loaf pan. Place the loaves in the oiled pans (preferably glass), cover with a heavy towel, and let rise until truly doubled and fully above the tops of the pans, 1 to 1 ¼ hours. Baking. Heat oven to 400° F. Slash a pattern in the top of the loaves. One baker in Milan cuts the shape of a stalk of grain on the top; elsewhere bakers make 3 parallel slashes. Bake 40 to 45 minutes; bake the last 5 to 10 minutes out of the pans on a baking stone or baking sheet to brown the bottoms and sides. Cool completely on a rack. I ended up using just less than 1 cup of the ground up oats - ladies you should be proud of me, I didn't just toss in all the flour and end up with a too dry dough. See, I am learning! The dough rose like mad, and after the first rise I cut it in half, shaped into 2 loaves and let it rise again. Before baking I scored a "wheat pattern" (don't make fun) into one, and an R into the other. R for Righteous bread? You decide. Thanks Tanna for this hearty and delicious bread! Happy Anniversary to us, here's to many more years of baking together. Thank you to everyone who has sent me comments and emails about my notebook posts. I am glad that you are enjoying them almost as much as I'm enjoying re-reading the books and picking the recipes to cook. I may have to do this on a regular basis! So Book Four - this is a big one. 178 pages of recipes, and most pages have 2-4 recipes per page. And you know, this one beats out Three for awesome untried recipes. Mu Shu Pork. Porchetta style roasted pork. Chicken Mole! Coconut Shrimp. Satay. Peking Chicken. Spinach latkes. English Muffin bread. Curried Pea soup. Aieee! I can't look anymore! Too much goodness. Look look look! What would you make first? On the left page there, I've wanted to try that Pepper Jelly Tart recipe for YEARS. Finally, with this notebook sharing series, I finally have the chance....and chose another recipe instead. SMRT! I bet you think I made the potato galette, cause you know I'm mad crazy for potatos! But I didn't. I made the onion rings. Because, mmmmmm. O-Rings. Got a hankering for onion rings but don't want to go out or fry? Then make these. They're sort of ugly, but tasty. Whisk the egg white, buttermilk, flour, salt and cayenne until smooth. Separate the onion slices into rings and pick out 12-16 of the best rings. Reserve the rest of the onion for another use. Heat 1 tsp of the oil in a large frying pan over medium high heat. Dip onion rings into the batter and cook in skillet (in batches) until golden on each side - 1-2 minutes per side. Place browned rings on a baking sheet. Once all the onion rings have been browned, bake them for 12-15 minutes, turning once, until crisp and golden. Everyone should head over to Once Upon a Feast (after finishing this post of course) and wish Ruth a very very happy 100th Presto Pasta Nights! I thought for this very special occasion I'd share my current favorite pasta dish - Linguine with Lemon, Feta, and Basil. My Mom found this recipe, which comes from Gordon Ramsay's latest book Cooking for Friends, in a food section of a newspaper in the Fall. She made it for us using fresh pasta she'd bought from an Italian deli on the north shore, and after one bite, we decided to add it to our menu for our Italian themed Christmas dinner. Unfortunately we had too much food planned and scrapped the pasta at the last minute. I knew this was the dish to make to celebrate Ruth and PPNs big milestone. This dish is extremely quick and easy to make. The sauce takes only minutes to prepare; all your waiting time is in cooking your pasta. I've had this with both fresh and dried pasta, and while fresh is always tastier, dried is almost as good. The recipe calls for pine nuts, which I don't really care for. I omitted them in this version. Cook the fresh pasta in a large saucepan of salted boiling water for 2 minutes; if using dried pasta, cook according to pack instructions until al dente. Tip the pasta into a colander and drain off most of the water, leaving about 2 tablespoons in the pan. Return the pasta to the pan and add the olive oil, lemon juice and zest, parmesan, basil and three-quarters of the crumbled feta. Toss well and check the seasoning. Divide among warmed plates and scatter over the remaining feta and pine nuts. Serve at once. Cheers to Ruth, and congrats on 100 editions of Presto Pasta Nights! Here's to many more. So here's my double love for this months WCC- I made the food that I love (pulled pork sandwiches) with the dude that I love. Did you see how I made it rhyme there? Here's my 5 lb boneless pork roast. The recipe calls for you to rub the spice rub on the pork right before you brown it. We rubbed in the rub the night before, wrapped it in a bag, and fridged it overnight. Then the next afternoon we browned the roast on all sides. After the roast was browned it was wrapped in a double layer of foil, placed in a baking dish and put in the oven at 300' for 4 1/2 hours. Then you unwrap the top of the foil, exposing the top of the roast, increase the oven temperature to 450' and cook another 20 minutes. as a piece of glass broke off the dish and cracks appeared all over the sides and bottom of the dish. Frack. We put a bath towel around the dish, in case it shattered, and got the pork out of there. Most of the juice ended up in the dish, rendering it all useless. There was about 1/2 cup in the foil that hadn't been in contact with the dish, so we kept that. Dammit! Now I have to buy a new damn 9X13 pan. After we calmed down, Scott shredded the pork, added the reserved juice, and the rest of the dressing ingredients. We made her coleslaw recipe too. It was too spicy. Coleslaw and pork on a toasted onion bun. Served with a side o'beans. This was heavenly! The pork was so tender and nicely seasoned. The vinegar dressing kept it nice and moist, and if I'd been able to use all the juices (I estimate I lost about a cup) it would have been that much better. I wasn't crazy about the coleslaw though - not very interesting and a little too spicy. The hot sauce we're using right now is nuclear-hot, so I cut back on the amount of hot sauce and pepper flakes in the slaw, but it's too spicy on its own. Good on the sandwich though. Also, boring - no carrot or anything else that could add flavor or character. The coleslaw recipe is here, if you're interested. They seem to have edited the pork recipe online, so here's the magazine version. In a large skillet or Dutch oven, heat the oil over medium-high heat. Add the pork and cook, turning occasionally, until browned, 8 to 10 minutes. Transfer to a 24-inch-long sheet of heavy-duty foil and double-wrap the pork. Place the pork, skin side up, in a 9-by-13-inch baking dish; roast until tender, about 4 1/2 hours. Remove from the oven and carefully unwrap the top of the pork. Increase the heat to 450' and roast for 20 minutes more. Transfer the roast to a large bowl, along with any juices. Using two forks, shred the pork. Add the vinegars, sugar and hot sauce; toss. Serve on the hamburger buns, topped with coleslaw. Want to take part in WCC? Find a recipe that fits the monthly theme. You can use a recipe from a cookbook, magazine, website, your Mom, whatever. Make it, blog about it with a picture and the recipe (if you like) and email me a link to your post by February 28. I'll have the roundup posted a couple of days after that. My email is iliketocook AT shaw DOT ca. What surprised me about Notebook 3 when I went to flip thru it to write this post was 2 things. First, how many of the recipes in its 46 pages I've already tried, and second, how many damn good recipes are in here. Right now I'd wager that this one has better recipes over all than 1 or 2. My mom's bean salad recipe is in here, and we know that's a winner. So is her Mediterranean Chicken and Pasta which is so good. Zucchini Fritters, Asian Smoked Chicken and Mu Shu Chicken are some other good 'uns. Also? Cheese Jalapeno Muffins. Still on my to make list - Turkish Delight (sort of scared to try to make it), Chicken Lettuce Wraps, and Dill Pickles. Mmmmmmmm. Although my plan for this cookbook reminisce was to make untried recipes from all my notebooks, from Book Three I chose a recipe I'd previously attempted. Back in 1997, when this book was being worked on, I bought a copy of Gourmet magazine which had a recipe for a baguette. For some reason, I made it as a gift for a co-worker "friend". I don't remember why. What I do remember is the morning after I gave it to her, she came to work and ..... well, she trashed my bread. I no longer remember why she didn't like it, valid or not (I suspect not) but it shattered me. I'd been so proud of the bread, dammit! I didn't try to make bread again for years. So when I saw this was the book that the supposedly horrid baguette came from, I had to try it again. And guess what? It was pretty ok bread. I've made better, but this was not too shabby. The relatively large amount of salt in this bread is the secret to a full-flavored baguette. In a large bowl sprinkle yeast and sugar over warm water and let stand until foamy, about 5 minutes. With a wooden spoon stir in 2 cups flour until combined. Stir in salt and 2 cups of remaining flour until mixture forms a stiff dough. On a lightly floured surface knead dough with lightly floured hands 8 minutes, or until smooth and elastic, kneading in enough of remaining 1/2 cup flour to keep dough from sticking. Transfer dough to a lightly oiled deep bowl, turning to coat with oil, and let rise, bowl covered with plastic wrap, until doubled in bulk, about 1 1/2 hours. Punch down dough and form into a long slender loaf about 21 inches long and 3 inches wide. Put loaf diagonally on a lightly greased large or 17- by 14-inch baking sheet and let rise, uncovered, about 30 minutes. Make 3 or 4 diagonal slashes on loaf with a sharp knife and lightly brush top with cool water. Bake loaf in middle of oven 30 minutes, or until golden, and transfer to a rack to cool. When I say Macaroni and Cheese, what do you think of? Do you think of ooey, gooey 4 cheese macaroni and cheese that your Mom or Grandmother used to make, oozing all over your plate? Do you think of little squares of firm mac that stay together until you cut into it with the edge of your fork? Does your favorite macaroni and cheese have buttered breadcrumbs scattered on the top before baking? Do you add exotic ingredients like onions and wine, and fancy cheese? Or are you loyal to Cheddar only? Or, are you like me, and when you think mac n cheese do you think of this? Yeah, you're like me aren't you. Good old Kraft Dinner. KD. Splat, as we called it in high school, after hearing the, well, splat sound it made when a scoop of it hit the wall during a fight between my friend and her younger sister one night. 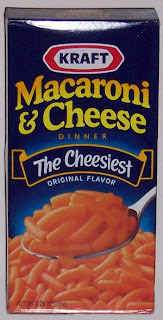 For most of my life Splat was the only macaroni and cheese I knew. It's cheap. It's easy. It's fast. And while no other mac could ever replace it in my life and bottom pantry shelf, I have discovered an interesting, tasty, more decadent recipe that I plan on making from time to time. Spicy Macaroni and Cheese with Chorizo Sausage from the show A Neely Family Holiday that the food channel aired here before Christmas. We don't get the Neely's show here (although I have seen a commercial that their new travel food show will be coming soon) so I was really interested to see it. Pretty much while they were still doing their intro with the dishes they'd be making, I was on the American food channel website looking for this recipe. People, this is darn good. Their recipe makes 6 to 8 servings, so I made a half batch, with some changes. Cook the pasta in salted, boiling salted water until al dente. Drain in a colander and pour into a large mixing bowl. Set aside. While the pasta is cooking, place the cherry tomatoes on a baking sheet and drizzle with olive oil and season with salt and pepper. Bake for 20 minutes, until plump and softened. Heat a large pan over medium heat. Saute the chorizo in a saute pan until crisp. Remove and drain on paper towel. Melt 3 tablespoons butter in a pot over medium heat. Add flour, stirring for 1 minute. Whisk in the warmed milk and bring to a boil. Continue to whisk constantly. Stir while adding the mustard, hot sauce and Worcestershire. Mix both kinds of cheese together in a small bowl. Set aside 1/2 cup of the mixed cheese for the top of the dish. Stir the 1 cup of cheese into the sauce. Cook and stir until the sauce is thick. Mix together the pasta, cheese sauce, chorizo and tomatoes. Sprinkle with the rest of the cheese and the fried onions. Since this has noodles in it, and since it's been a long time since I've joined in Presto Pasta Nights, I'm sending this to Ruth to share. It will knock your socks off with its cheesy, tomatoey, just a little bit spicy goodness.